Fluval 106, 206, 306, 406 external canister filters are in the Fluval 06 series – the most advanced and newest models from Hagen Fluval. They can provide a complete and multi-stage filtration system to keep your aquarium clean for a long period with only a little maintenance. 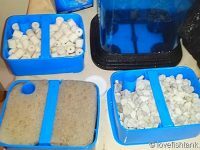 Moreover, these canister filters own many powerful and unique features making them one of the best aquarium filters on the aquatic hobby today. The most advanced features can be mentioned are durable construction, quiet operation, easy setup, quick and easy maintenance without mess that you can see in this review. 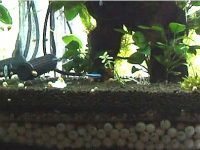 How to set up the Fluval 106/206/306/406 canister filters? The Fluval 106/206/306/406 canister filters are the external filters that can be used on various fish tank sizes up to 100 gallons. These filters use a multi-stage filtration to purify water and provide a healthier environment for any fresh or salt water aquariums. 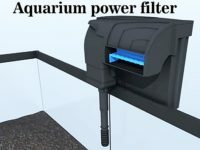 Moreover, they own the most advanced features of the newest 06 series canister filters from Hagen Fluval such as better filtration, faster setup, less maintenance, quieter operation… There are four models for aquariums from small to large. They come complete with media in all baskets for instant access and setup. The large baskets are able to accommodate various types of filter media for the most performance of all filtration types to keep the water clean, clear and safe for fish. Each filtration stage is separated from the others for flexibility in media change and maintenance. (1) Vertical large twin foams well perform mechanical filtration trapping debris, preventing clogging and reducing maintenance. (2, 3, 4) Multi baskets for containing various types of filter media (mechanical, biological and chemical filtration) which keep your aquarium water clear, clean and free of nitrogenous toxins (ammonia and nitrite). 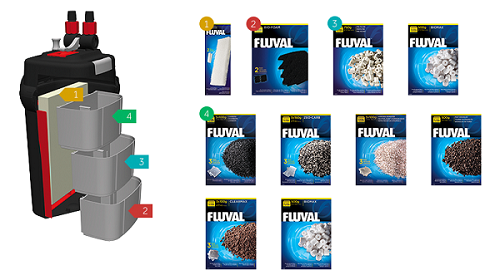 Unlike other canister filter brands, the mechanical stage of the Fluval 06 series is a large vertical cartridge including four foam pads which provide a large surface for trapping more waste matter. That means the mechanical filtration is best performed and these canister filters need less maintenance than other ones which put small foams in the baskets. The square shape will take 35 to 50 % more water than the round canisters of the same size that results in the better and cleaner filtration. 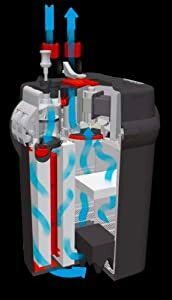 Besides, the larger filter captivity provides the better filtration and reduce the maintenance, change just what you want when you want to change it. 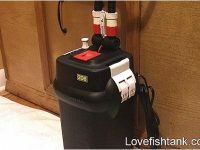 The setup only takes less than 20 minutes to have a good water flow being pumped into your aquarium. These filters have the improved priming system to start the water flow to the aquarium easier than before, Fluval 05 series. Only press the prime button several times until getting the first water flow from your aquarium and the gravity will do the rest work to fill the canister. The motor impeller (electric pump), which is placed inside the lid, operate the entire canister filter. The pump removes the water from the canister and return it to the aquarium, where by the water is constantly circulated and filtered. The impeller is designed with a sound dampening system for a quieter environment while operating. The impellers are improved to consume less energy than other comparable canister filters. The flow rates of Fluval 106, 206, 306, 406 canister filters are respectively 145, 206, 303, 383 gallons per hour that clearly higher than other canister filters (of other brands) rated for the same tanks size. Because of the higher flow rates, Fluval 06 canister filters are very effective in keeping your aquarium water constantly circulated and filtered. Water flow is significantly increased and filtration enhanced due to the ability of these filters to use the entire canister space. Water stays in contact with media longer for better filtration due to convoluted water flow pattern. 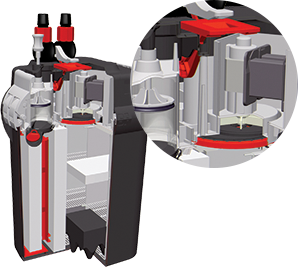 There are Aqua-stop valves (see the next section) offering the ability to decrease or even stop the water flow through the filter. By controlling the Aqua-stop valves, you can acquire the desired flow rate that perfectly meets the need of your aquarium inhabitants. Aqua-stop valves make maintenance easy by shutting off water flow without disconnecting hoses and therefore eliminating leaks and mess during disassembly. Lift-lock clamps securely and quickly lock the lid in place. It is made of glass fibers ensuring strength and durability. With the lift-lock clamps, it is very easy for you to assemble as well as disassemble the Fluval canister filters for setup and maintenance. More expensive than other canister filter brands. Everything coming in the box is ready for you to assemble the filter following an instruction video from the manufacturer. Even the filter media that go into the three filter baskets are supplied and ready for the setup. 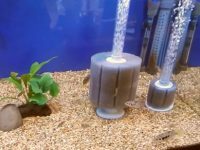 All you have to do is to put them together and all the procedure takes only about 20 minutes until the first water flow pumped into the aquarium. Following is the great video from the manufacturer (Fluval Aquatic) for assembling the Fluval 06 series. According to how many and what types of fish you keep in your aquarium, your canister filter will need to be cleaned every one to three months. 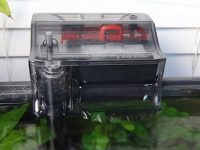 The maintenance of the Fluval 106/206/306/406 is very simple because of their advanced design. First, plug your filter out and close the Aqua-stop valves to disconnect the water flow from the tank. Then, open the lift-lock clamps and you can access the internal filter media chambers for cleaning. I usually clean my canister filer in the same time with aquarium water changes. I keep the old water from the water changes for cleaning the filter media. Because tap water containing chlorine compounds harmful to live organisms, using old aquarium water to clean your filter media will help to reserve the helpful bacteria living in these materials. After cleaning the filter media, reassemble the canister filter and plug it in. All the process includes only some basic steps and is very easy to do for anyone, even starters.